we have a pipeline setup to build all branches. on an initial push of a branch two builds are kicked off for the branch that is pushed at the same time. two pushes are delivered at the same time and thus two builds are run. The two pushes seem to be 1 from a repo hook and 1 from the org hook. see the webhook to our ci-m1.body.prod server. wondering if maybe i just have a misconfiguration...but i don't think so. also it'd be REALLY nice if that log included the X-GitHub-Delivery request header to help trace issues back to github. 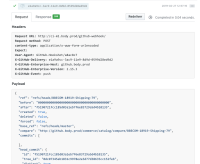 chirs damour added a comment - 2019-02-27 23:22 also it'd be REALLY nice if that log included the X-GitHub-Delivery request header to help trace issues back to github.